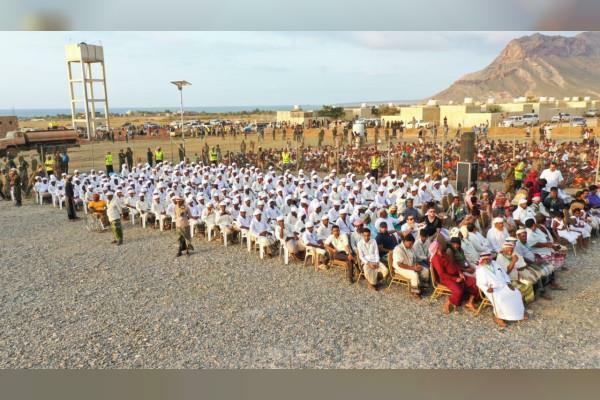 ABU DHABI, 14th April, 2019 (WAM) -- Upon the directives of His Highness Sheikh Mohamed bin Zayed Al Nahyan, Crown Prince of Abu Dhabi and Deputy Supreme Commander of the UAE Armed Forces, the Emirates Red Crescent, ERC, is organising the second phase of group weddings in 11 Yemeni governorate, which will see 1,100 couples married in 2019. Dr. Mohammed Ateeq Al Falahi, ERC Secretary-General, stated that the group weddings are part of the UAE's humanitarian and social initiatives in Yemen, upon the directives of His Highness Sheikh Mohamed and the monitoring of H.H. Sheikh Hamdan bin Zayed Al Nahyan, Ruler's Representative in Al Dhafra Region and Chairman of the ERC. He also highlighted the generous support of His Highness Sheikh Mohamed for the weddings, which are part of a major social family project adopted by the UAE, under Sheikh Mohamed's patronage, to support Arab youth. Al Falahi added that Sheikh Hamdan is closely monitoring the humanitarian conditions in Yemen and the movement of relief aid around the region, while directing the ERC to respond to the country's requirements. He noted that the group weddings coincide with the Year of Tolerance, and are part of the UAE's response to meeting the needs of the Yemeni people.